In October 2008, even as the world reeled under the collapse of the financial system, Baba Kalyani called a meeting of his senior managers at his Pune-based company, Bharat Forge, to take stock. The meeting included his son and the firm’s executive director, Amit Kalyani. Their worry, however, was different. There was a backlog of orders from automobile companies around the world and they needed their managers to speed up supplies. They brainstormed and scripted a detailed plan to meet the robust demand. Two hours later, a satisfied Amit Kalyani left for a holiday in Maldives. When he returned, bad news awaited him. The world had turned topsy-turvy in a matter of just four days. The financial markets were collapsing and business houses were shrinking. Bharat Forge, a maker of stuff like axles and crankshafts for big truck manufacturers in the US and Europe, was staring at a flurry of order cancellations. The fear of his customers of a bleak sales outlook would prove correct very soon. The backlog was just a memory. “We didn’t know how to react for a couple of days,” recalls Amit Kalyani. For the quarter ended December 2008, the company posted a consolidated loss, its first one in a long time. Capacity utilisation fell to an all-time low of 20 percent and the company’s factories operated only a few days in a week. Baba Kalyani looked around and saw other automobile companies scaling down plans, firing workers and go into near hibernation. The doyen of India’s automobile parts industry, the 32nd richest Indian according to Forbes, had the same choice. But Baba Kalyani had other plans. Two years later, Bharat Forge has still not come back to its peak annual revenue $1 billion plus seen in March 2008, but the unfolding of an exciting new chapter in its history is unmistakable. Having used the slowdown as a test bed for an entirely new growth plan, Baba Kalyani is now moving into mission mode and fast-tracking investments in a new range of manufacturing businesses. He has also earmarked Rs. 1,500 crore over the next three years to build more factories. The audacious plan will see Bharat Forge enter areas offering bigger opportunity but also higher risks. Kalyani will make metal parts for energy, oil and gas and construction sectors and take on — for the first time — much larger firms like Larsen & Toubro and Bharat Heavy Electricals. It will also compete against multinationals like Siemens and a rash of nimble-footed players like Reliance Energy. At his Pune factory, Kalyani is well-known for his impatience. His S-Class Mercedes would drive in for meetings at the campus much before others in the executive suite. No wonder, then, that he loves fast cars and fast bikes; and that his business plans are being implemented at breakneck speed. As early as 2005, Kalyani had started scouting for new growth avenues. He had felt the limitation of catering to just the automotive business, even though five years earlier, he had gone ahead and acquired a clutch of small companies in Europe to augment technology for his forging business. Vehicle production in the US went down from 11.26 million in 2005-06 to 5.69 million in 2008-09. European production has also been declining simultaneously. Kalyani knew the markets where he got a premium for his products were shrinking. “Kalyani had few alternatives in his forging business. He had to look out to grow further.” says Shankar Sharma, head of research firm First Global. What makes Kalyani’s new game plan noteworthy? At the turn of the century, Bharat Forge was just another company in the $1 billion auto ancillary industry. Following a slowdown in the Indian commercial vehicle sales during 1997-2002, Kalyani had pushed hard to increase his exports. Six years after that plan which took the company’s sales beyond $1 billion, Kalyani is not trying to consolidate further despite the deep cuts the downturn inflicted on his main business. Rather, he is impatient for the next change. It’s not that everything is already hunky-dory with the forging business. Like other companies such as Mahindra & Mahindra which also made small European acquisitions in the auto component segment, nearly all of Bharat Forge’s overseas subsidiaries posted a loss last year. It paid out Rs. 74 crore as redundancy payouts for reducing manpower at its European factories and the company closed down its Scottish operations. “There is still more work to be done but the worst is behind us,” says Kalyani. The European challenge was a tough one. Kalyani started off on a wrong note. In July 2008, he and his top team told the management of the European arms the imminent danger lurking in the market. “No one believed us as there was just good news all around,” says Amit Kalyani. But the company kept communication lines open. As it shared the growth plans and also a part of their profits in 2006-07, the unions were more flexible when the crisis hit in 2008. The 2008 downturn taught the firm several important lessons. Amit Kalyani acknowledges that before September 2008, growth was the predominant mantra at the company. In the heady days, it was all about global expansion and market expansion. A review of 2009 made it clear that just having a growth-oriented strategy clearly has its pitfalls. “The focus now will be to actively de-risk all we grow each of our businesses,” he says. The process began with operations, even though Baba Kalyani thought he was already running a tight ship. When volumes fell off the cliff, capacity utilisation shrunk across plants for Bharat Forge. Kalyani’s new target to managers, who came to work sporadically during those days, was to find a way to make profits even in the really slack periods. One of the earliest opportunities to both fend off the impact of slowdown and implement the new plan came in the form of a European maker of very large ship engines. Bharat Forge had to design a new crank shaft for this customer, much larger than the kind of stuff it was used to making. The customer, whom Kalyani won’t name, gave a trial order for redesign the shaft to make the engine lighter. 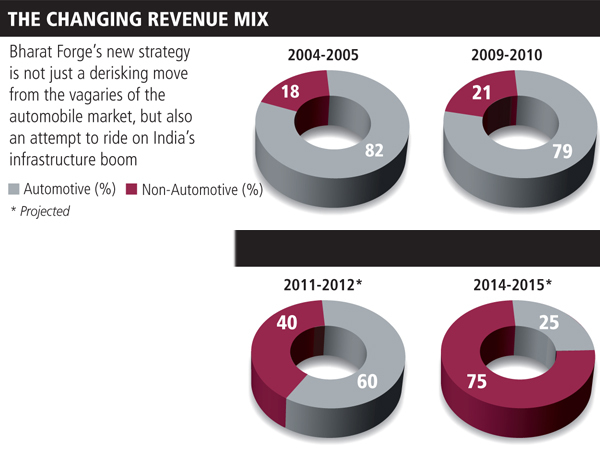 Unchartered territory for Bharat Forge, but a rare chance to increase its technical prowess. The engineers succeeded in the attempt and won the final order as well. This experience had two benefits. One, it opened Baba Kalyani’s eyes to the business of reducing the weight of forged components. Two, it gave him a means of engaging his engineers profitably. “This way, in ten years from now, I would expect that our products to have much higher level of intellectual property,” he says. For his new business in power equipment, Kalyani is doing something very different. In an unique move, he has entered into joint ventures with two European firms, Areva and Alstom, to make components for the power sector. The company also has a tie-up with the state owned National Thermal Power Corporation (NTPC) to manufacture high pressure pipings, casting and forgings used in power, oil and gas, petrochemicals, steel and mining sectors. However, the crucial question in the new ventures is, how does Kalyani plan to compete again the established and experienced players like BHEL and Larsen and Toubro? Till recently, he had been mainly selling forging parts to original equipment manufacturers. How would he develop the expertise to sell his new equipment as a part of large project that may take months to conclude the deal? Industry experts feel that in the two joint ventures with European firms (to make turbines and stainless steel parts for nuclear plants), Bharat Forge will be the Indian facilitator. Like many other Indian entrepreneurs, it will help in building the plant and local logistics. This will give it the required technology expertise. Interestingly, the transformation of Bharat Forge has parallels in the history of the global forging business. In the 1970s, Wyman-Gordon, then a giant, moved away from automotive forging in response to rising global competition in the car business. It expanded in different directions, but at some point, had to find a narrower focus. Today, it is primarily an aerospace forging company. It appears that as every country goes through a major build-up of infrastructure, it needs automotive forging companies to diversify and meet the new demand. But as the infrastructure gets built, these companies may have to scale back to a handful of core businesses. For India and Bharat Forge, the journey has just begun.